Here's a small selection of our most popular Cross pens and sets. Creating an executive impression has never been easier with this elegant chrome ballpen. 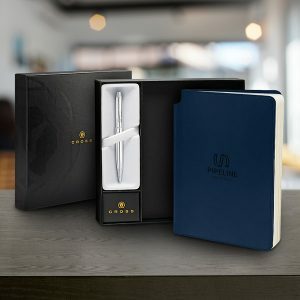 The ballpen is accompanied with a medium journal to present a stylish gift set; an ideal gift for valued customers or employees. Branding can be applied to the pen, notebook and packaging to ensure that your logo is seen. Personalisation is incredibly easy on this gift set, which can be wrapped in a delightful presentation box, ideal for your most valued customers or employees. Whilst elegant and stylish in its design, this high-tech Roller ball pen incorporates a more modern, cap less design with a vibrant metallic finish. Through patented slide open and snap shut technology, this pen offers an exclusive alternative to standard push or twist click writing instruments. Your logo can be printed on top of the barrel or engraved on the metal slider. A combined custom lustrous chrome pen and pencil inside one corporate styled set. This gift set offers plenty of opportunity to apply your own style with branding available with engraved designs on both the pen, pencil. For extra impact, add your logo to the gift box! A legendary ballpen with a classic style and bold profile. The width of this eloquent pen offers a firm grip and plenty of opportunities to apply your own creativity. If you would like more information, or for a free quotation on any of products in our range, then please feel free to give our friendly team of customer advisers a call today. Pens and Sets are all presented in a gift box, ready for you to send out in style! Cross offer the finest luxury branded pen gift sets. Originally founded in 1846 Cross started as a watch and jewellery maker, Cross then branched further off into the corporate gift market to offer fine quality writing instruments. You can see their rich history in many of their designs. Precious metals and jewels are often incorporated into many of their stylish products, making them a treasured item.